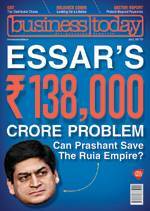 This refers to your cover story on Essar (Prashant Ruia's Quest to Save Essar, July 2). It was an insightful analysis of the business dimensions of the group. Business Today has brought the group under rigorous lenses of organisational climate, business competence, financial viability and critical remarks of business-watchers. Essar tried to have a finger in every pie, and resultantly they have burnt their fingers. Its entire story was full of commercial quirks, financial kinks, indifferent attitudes, governance slips, and growth distorts. Their rampant investments here and there and allegedly cooking up the books have scripted a sure recipe for organisational disaster. In 1994, the group landed in a controversy by putting the tentacles of its seven investment firms to acquire 67 per cent holding in Tamilnad Mercantile Bank. However, such share transfer was disapproved by the RBI. An organisation has to maintain its integrity, including accounting standards, for the promotion of its growth and image. When former US President Abraham Lincoln's stepbrother demanded his ancestral property of a cultivable land as a coparcener for selling it to better his life, he agreed, but said that when a man cannot improve his life with property, cannot do without property either. The escapades of Essar will be an eye-opener for the Indian industry as promoters, and entrepreneurs. Organisations take long time to build image demanding diligent efforts, but they will lose it in a jiff if they indulge in contentious business moves. Essar's `1.38-lakh crore debt-reconstructing will certainly be a formidable challenge beyond its endurance. This refers to your article on Air India (Maharaja on Sale, July 2). It is an open secret that most government organisations fail to meet expectations of the public. All public sector and government companies can deliver good results if they maintain a strict discipline like in private companies, with accountability and penalties. In 2010, former Prime Minister Manmohan Singh had proposed that babus be made more accountable by penalising them for non-performance. Delhi government was first to test the system. Those not completing a job within the prescribed time were to be fined `10 to `200 a day. But that proposal never saw light of the day. So, it is quite necessary now that provisions are implemented and acted upon, and monthly or quarterly reports of the government's performance are published in the leading newspapers for public awareness. This refers to your article on quality medicines (Need for Quality Checks, June 18). Why there should be more than one quality of any product in the international market? Globally, every product should have only one quality for markets. Multinational companies operating in India also should not have dual quality.